Our 14 networked offices cover 8 counties and central London to give your home exposure to a vast database of applicants. With Over 50 years' experience, Our local people have first-hand knowledge of the areas we cover and are here to help you with all things property. Whether you're looking to settle down in a thatched cottage or put your own stamp on a new build, the idea of living in the country is enchanting. When you use Michael Graham, you're investing in over 5 decades of experience - in a company whose heritage is built on client care. During this time, we've grown to 14 networked offices covering 8 counties and central London. Our local people have first-hand knowledge of the areas we cover so you can be sure of receiving expert advice and recommendations. We maintain close links with local communities and sponsor approximately 80 events across our region. By maintaining a high profile with newspaper coverage in The Sunday Times and Town & Country publications, we can make your dreams of the country lifestyle a reality. We're here to help you with all things property: buying and selling, renting and letting, private finance and land acquisition, and we have some of the most desirable town and country homes available to rent or buy. Our offices are open seven days a week for your convenience – contact us and find your dream home today. 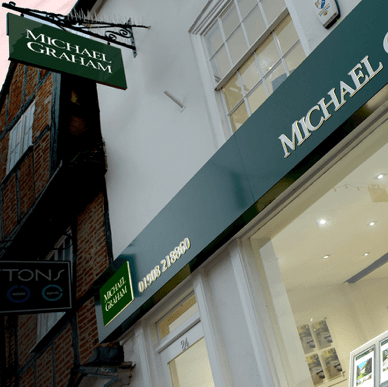 Michael Graham estate agents are continuing to grow with potential locations already in the pipeline for this year. We plan to employ both new and experienced team members for these locations. So, if you are seeking a career within the best Estate Agency in the area, please apply via the Register Your Interest section shown below.